This trip was a chance of a lifetime. The additional good part is that now that I had the experience and now have the knowledge about flying in the area, I can go back and enjoy it again. Flight path there: desired KLMO-RAMMS-LAR-CKW-RKS-KEMM with an IFR flight plan and KEMM-KSUN-KMYL afterwards. I have a center controller friend who was going to be on duty and hopefully be coordinating the first part of my flight. But Denver Approach had different ideas. They had me do the Yosemite Departure with YAMMI transition which took me around my friends area, but never into it. Bummer. 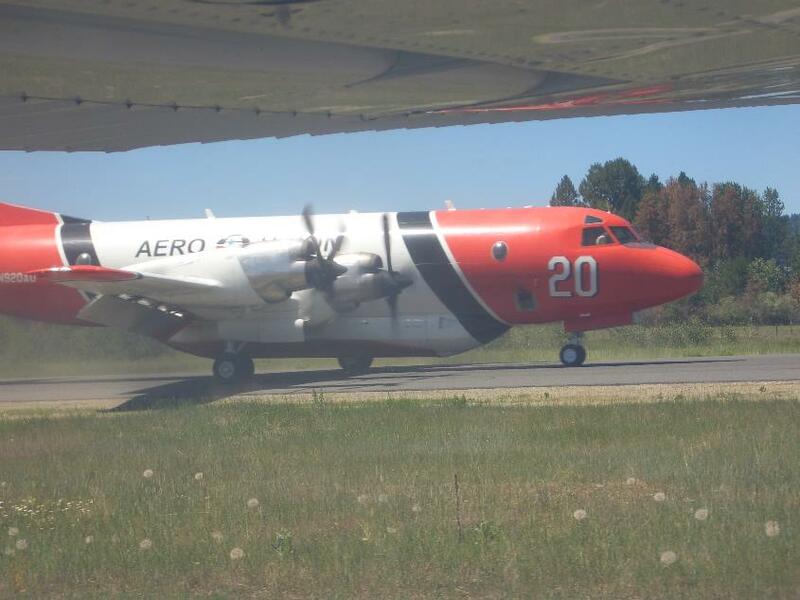 Arriving there, I was followed by a large 4 engine Air Tanker for Fire Fighting. I thought I would do a short approach and get off ASAP since he was pretty close on my tail. The other fun benefit was watching him from the taxiway as he landed. Very cool. There was lots of fire fighting equipment there. 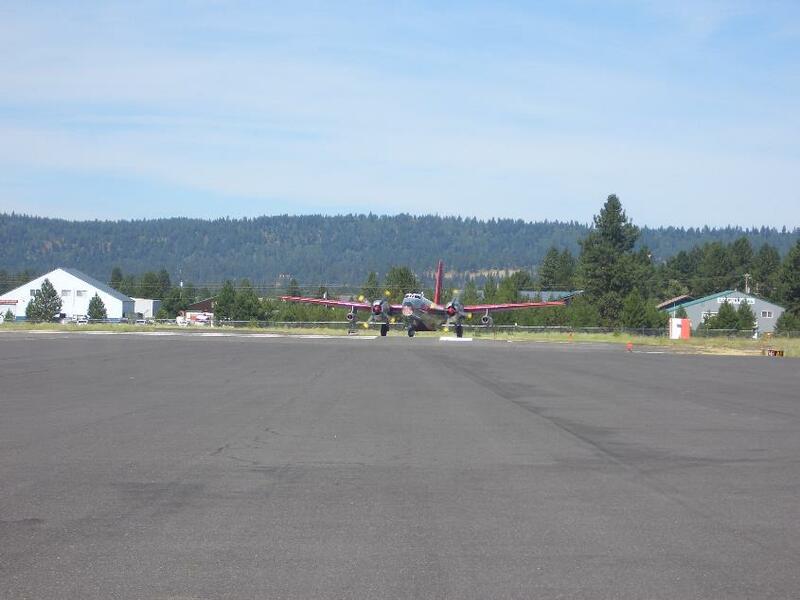 A couple Single Engine Air Tankers, a paratrooper plane, and one plane (N1386C) that appeared to have two jet engines and two radial engines... very strange. At the time there were fires in Utah and Oregon and near Bailey, ID. 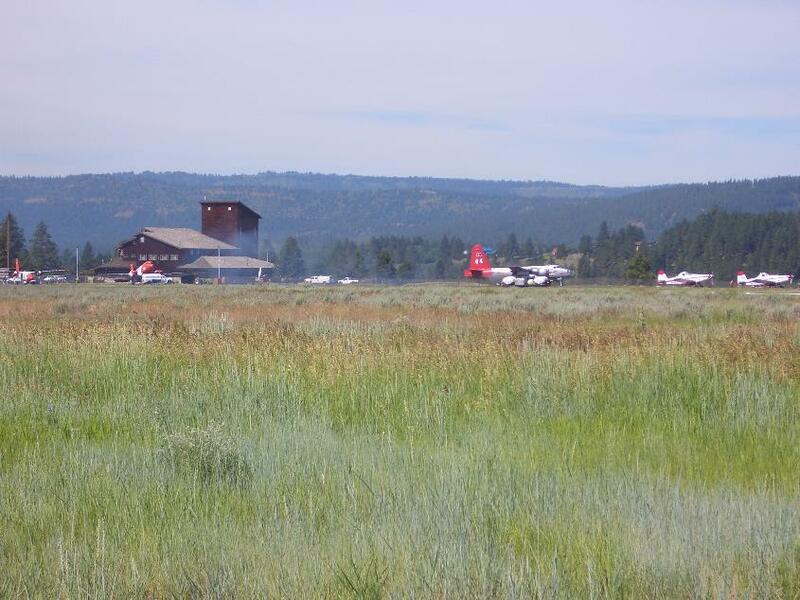 Shortly after my trip, there were numerous fires in the McCall area. I stayed at the Americinn Hotel which was very nice and directly across the street from the airport and was also where the lectures were being held. There was a free McCall Shuttle that will take you all over town including passing the hotel. 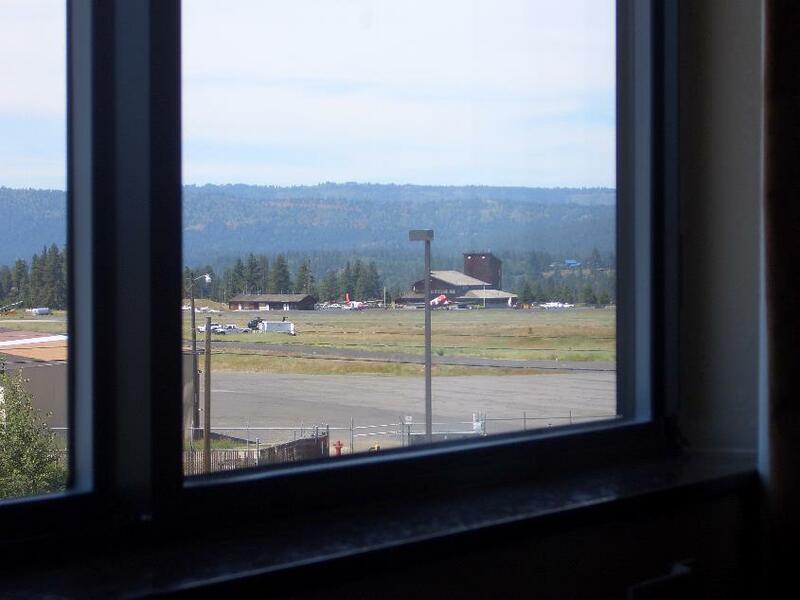 I could even see the fire fighting planes from my window. 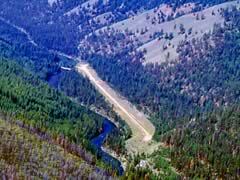 The seminar I took was from McCall Mountain/Canyon Flying Seminars and I took the basic course. This was a very cool seminar with a lot of great energy with the super experienced flight instructors and a group of experienced students all excited to learn a lot. 3 days of flying in the morning and 4 afternoons of lectures. All of it great. There were 10 students and 5 instructors. There were 2 morning flights per instructor and each student changed instructors each day. This worked nicely for me. The instructors they have are incredibly experienced pilots and instructors. Art Lazzarini: 19,000 hours of instruction experience in 27 years of mountain flying. An A&P too. Bart Welsh: Instructor with lots of hours and and A&P. Rich Bush: 18,500 hours of flight experience, including over 3,000 hours as a flight instructor and over 1,000 hours in the Idaho backcountry. He has flown over 100 types of aircraft. The first flight day was going over lots of slow flight including many many stalls and then some takeoffs and landings at grass strips. The stalls and slow flight were to determine the best slow flight speeds for my particular plane (every plane is a little different). For me, slow canyon speed was 20 degrees flaps, 17" MP, and 85mph. Short field approach of full flaps and around 65mph; some power is preferred so you have more options. With that approach configuration, your wings are almost level with the horizon, but you descend quickly. The touch down and landing distance is short too. It works well. Then it was time for my first soft field landing at New Meadows (1U4). Not to big a deal and a great experience. We did quite a few landings. 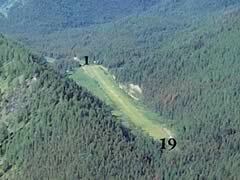 Then on to Ski Valley air strip (A private strip I believe). It was a warm day and I had loaded up the plane so it was getting closer to gross. This made the takeoff and landings more challenging but realistic. The winds started getting a little funny including coming down the valley at just the strength to confuse which direction to take off. One time, we took off upwind, but uphill. It ended up a with a crosswind turn pretty close to some trees; at least it felt close to me. Good to have an instructor with and reinforced that taking off uphill should be done with great caution. Then on to the second flight day. 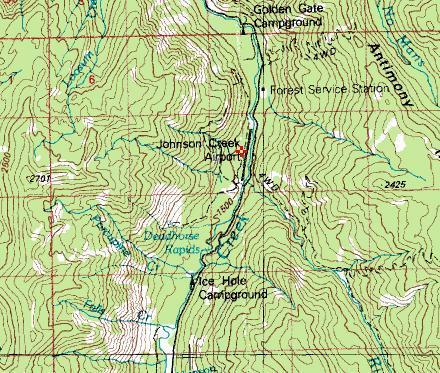 Johnson Creek(3U2), Landmark(0U0), Indian Creek(S81), and Sulfur Creek(ID74). Some people went into more advanced strips, but these were great for me. I had not been in the Idaho area and had not landed on grass until this trip. The ridges to the left and right are about 4 miles apart and are at 2701m (8861') and 2425m (7956'). 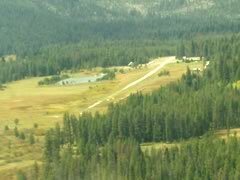 Johnson Creek airport is at 4933'. About a 4000' hill to the left and 3000' to the right. For comparison, the Grand Canyon near the visitor center goes from 6878' to 2600' to 7600' in about 6 miles; 4000' south vertical and 5000' north vertical, but over a larger distance. So the landing strip pictures do not give the full perspective. It was similar depth as the Grand Canyon. 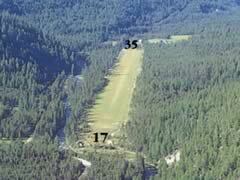 Landmark Airstrip was at a higher altitude and made the landing/takeoff a little longer. This was good practice, but I hear there is not too much to do at this strip. Sulfur Creek (Private Lodge with a restaurant and Cabins) Location for the Advanced Seminar. Then the third day. Big Creek (U60), Chamberlain (U79), Dixie USFS (A05), Warren USFS (3U1). This was the place I think I would be most interested to go back to. It has camping that seems nice and then there is a lodge for when you are lazy or tired of camping. Seems perfect. This one is maybe 50 miles from any road. Great camping and a river next to it. Dixie USFS was great. 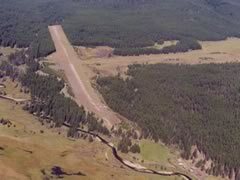 One of the great things for me is that we stopped there, shut down the plane for a few moments and heard the river and the birds and looked around at a beautiful grass strip and wild flowers. This is the first strip we really stopped at. There was a hiking trailhead about halfway down the airstrip along with a forest ranger cabin. It was amazing to think that I could fly my plane to a spot that was so beautiful. Warren USFS was pretty cool. It was on the edge of a small Idaho town. It almost feels like you are landing at the end of the main street. I highly recommend this seminar. I think it is best to take after you become very familiar with the handling of your plane. Practice your short field landings a lot without dragging the approach and chopping the power at the obstacle. After the seminar you become even better at everything. It also opens up the possibilities for some great adventure flying especially for somebody who likes the outdoors. They have an Advanced Seminar that hopefully I will take soon.